Don’t use : ; , " \ / * ? | # Tabulator. Step 4: Define corresponding primer sources in column C. Please use only one of the following terms: "Premixed", "Standard", "Enclosed", "Stored", "Custom", "Order", "Design". Select your Oligo from the favorie list in the drop-down menu. Click "Add" to add the chosen oligo to your order. You can enter the number of additional desired Oligos here, the order table will be extended with the denoted lines. Please choose your delivery format, like tubes or plate format & orientation from the drop down menu. If you need plates with empty wells, please use our upload entry with our excel order form. Please proof the correct delivery format after upload. For "Custom" dissolved oligos a query to Biolegio is necessary. Choose Custom and enter the desired values in the popup. On submit you need to enter a quote reference number for this specific order. If you have not yet received one, continue your order normally. You will be prompted to send a query when submitting. Please choose the desired Oligo Type from the drop-down menu if you need special specification, like RNA or NGS-Oligos. Please use a standard Excel Sheet. 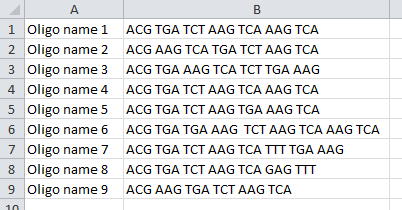 Enter oligo names (max 25 characters) & sequence in separated columns. Mark all oligos you want to add to your order and copy/paste the text into the popup. Primer added by Biolegio. Select your sequencing primer from a list of 94 standard primers which are stored at Biolegio (primarily for plasmids). Primer added by Biolegio. Customer ships primer and DNA in separate tubes to Biolegio. Primer added by Biolegio. Prerequisite for this option: You have already sent the primer to Biolegio in the past. Your primer will be stored for 6 months at Biolegio. The primer name will be automatically deleted from this list after 6 months or if the primer has been used up. Primer added by Biolegio. This option is an add-on to the option "Stored at Biolegio". If you know that a primer will be used frequently in future orders, send us a larger volume of this primer (at least 50μl) and add it to your custom primer list. We will then store it for an extended period (up to one year). Primer added by Biolegio. Via this option you can order a new primer already during the order process without changing the order form. While your DNA is on the way to Biolegio, we will produce your sequencing primer and forward it to our sequencing lab. Primer added by Biolegio. This option is similar to "Order Now". In addition to primer synthesis Biolegio performs also the primer design. You just have to provide us by email with a sequence of 50 - 200 bases. Please choose this option in case you want Biolegio to purify your PCR product (removal of PCR primers and dNTPs). Please note that this service is only available at an additional charge. If you fill out a second email address, the confirmation of an oligonucleotide order will not only be sent to the main email address, but to the second address as well. cannot be offered within a punchout session, because the final price calculation depends on the samples you are turning in.